Agapanthus africanus growing herbaceous geophyte of the genus Agapanthus also known as African lily, Agapanthus perennial evergreen used as ornamental drought tolerant plant, can grow in subtropics, mediterranean, temperate, desert or tropics climate and growing in hardiness zone 6+. Flower color can be: purple, pink, blue or white the flower shape of trumpet clusters in umbel or ball shape. 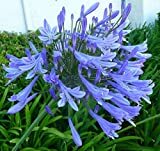 Agapanthus Notebook: A handy sized journal for all of your planting guides and garden ideas for landscaping. Home Comforts Acrylic Face Mounted Prints Agapanthus Africanus Blossom Bloom Agapanthus Print 20 x 16. Worry Free Wall Installation - Shadow Mount is Included. Trumpet shape that grow in umbel structure the color can be: pink, purple, blue or white.